This Friday I want to share some insta photos of Prague Cafes. Some of them are my favorite places and you can read more about it here. Enjoy! Masarykovo nábřeží (Masaryk’s Waterfront) is a waterfront on the right bank of Vltava River in Prague. It is bordered by the Jirásek’s and Legion bridges. Opposite from the waterfront you can find Slavic Island, you can read about it and see some pictures in recommendations section here. The waterfront was named after our first president Tomáš Garrigue Masaryk (pres. 1918-1938), but it happened as late as in 1990 year. Before it was named after our first communistic president Klement Gottwald (pres. 1948-1953). 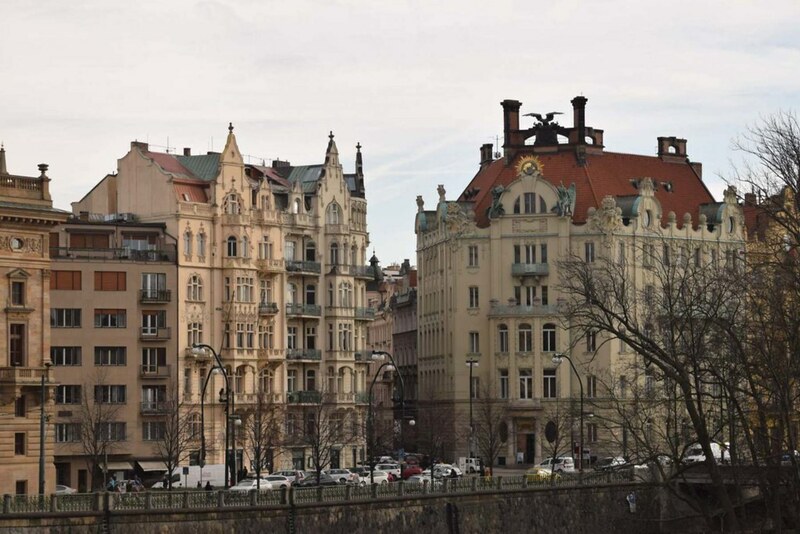 And during the WWII it was called Reinhard Heydrich Ufer, as the whole waterfront of Vltava River. The place is quite crowded with tram and car traffic. Up to 19th century this place was just a beach next to the river with mills and workmen “jirchář”, who were processing the leather there. Waterfront from the Legion Bridge. Now you will find quite beautiful buildings there, National Theater – this one deserves separated post, Goethe Institute building with fantastic sculpture decoration on the roof, Hlahol building built for Hlahol singing choir and being home of our first republic and later (1918-1942) movie stars; and we cannot forget water tower Šítkovská věž and modern building of Mánes House of artist above the river (between the embankment and the island). 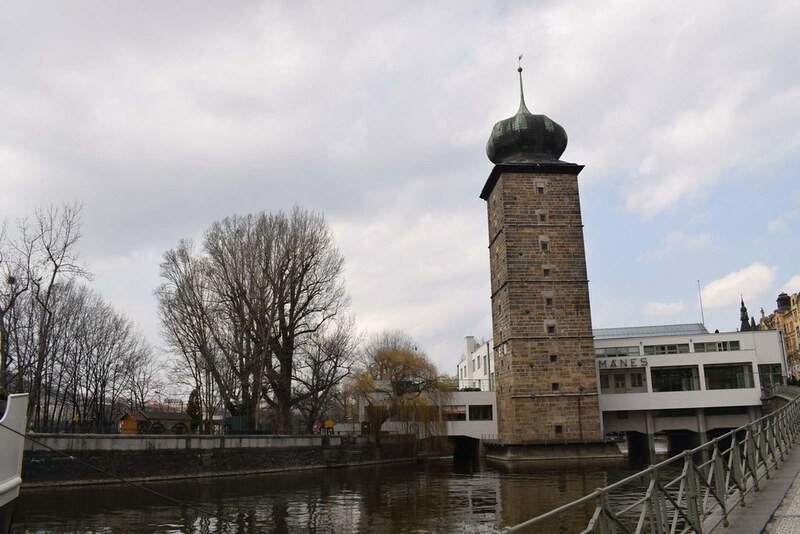 Slavic Island (left) and Water Tower and Mánes House of artists. 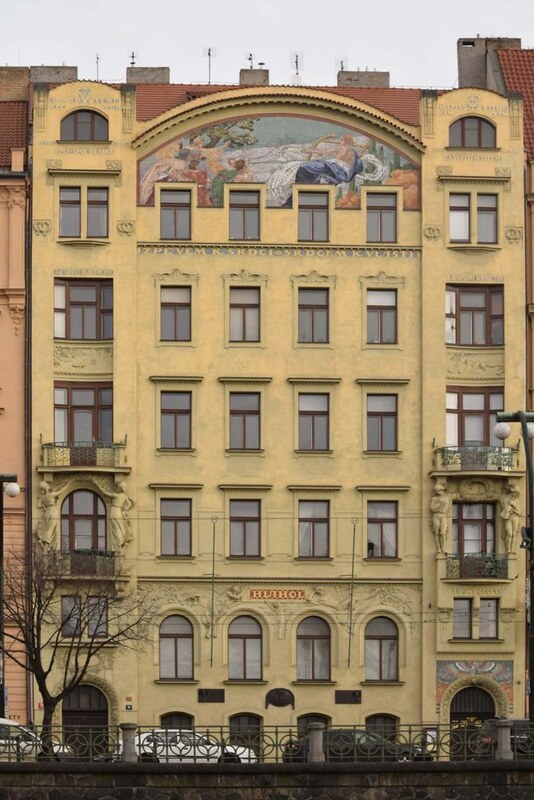 The architect of the waterfront concept was František Sander, and we can see the frescoes of the works done on the building number 30 (in the gallery picture: nabrezi (15), the one with the knight, bellow him). 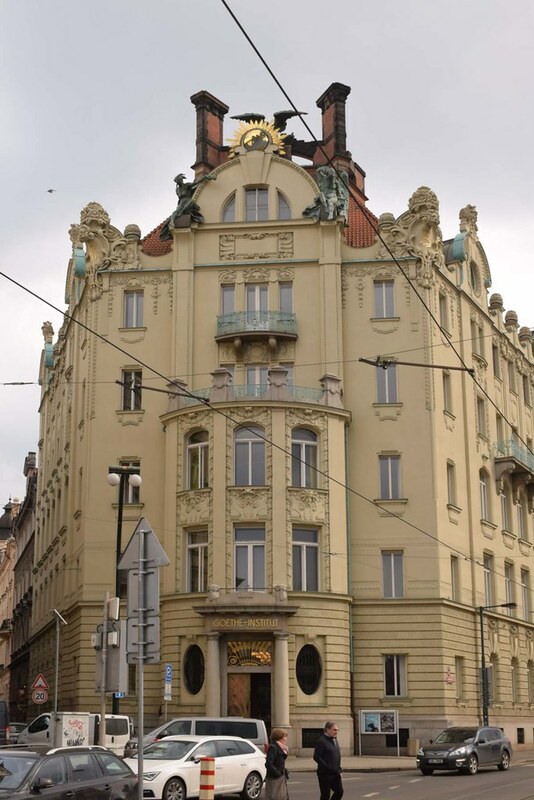 The author of former bank house, now Goethe Institut, was director or the Art school Jiří Stibral and the statues were done by Ladislav Šaloun (he is on plan to have his own post). 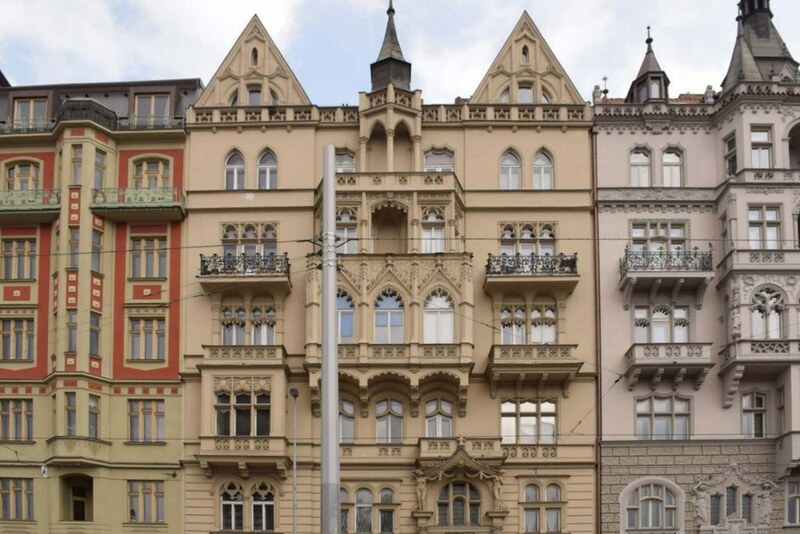 One of the most important art nouveau houses is the Hlahol house, done by architect Josef Fanta (Main Train Station in Prague) with mosaic (Karel Klusáček). 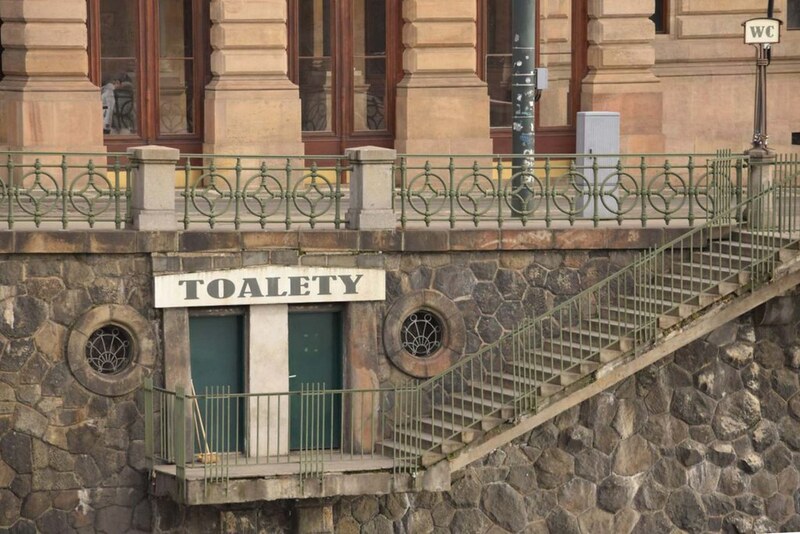 And if you need to go the bathroom (Toalety in Czech) after looking so much up, there is a nice place down 🙂 under the National Theatre (do not promise they are working). One more nice building on the waterfront. 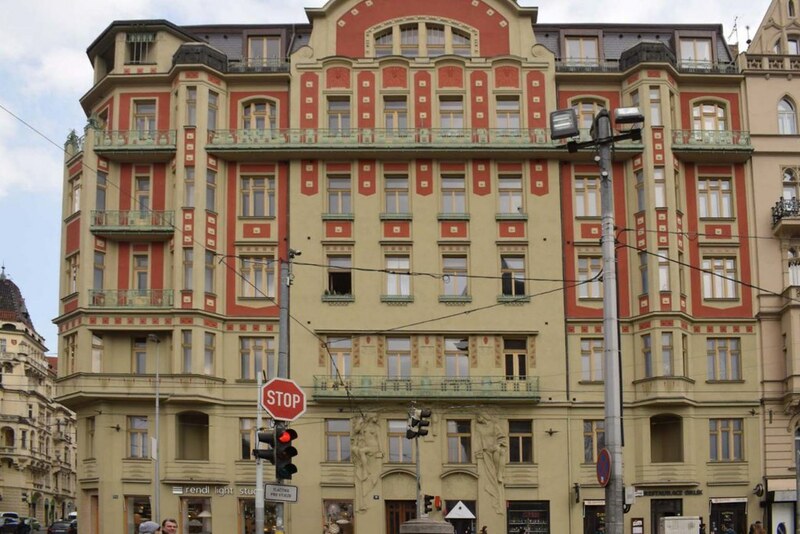 For you who needs a coffee after this tour, visit one of the most famous ones: Slavia cafe (surprisingly I do not have a picture, as I always forgot to make one) or Savoy cafe on the other side of the river. 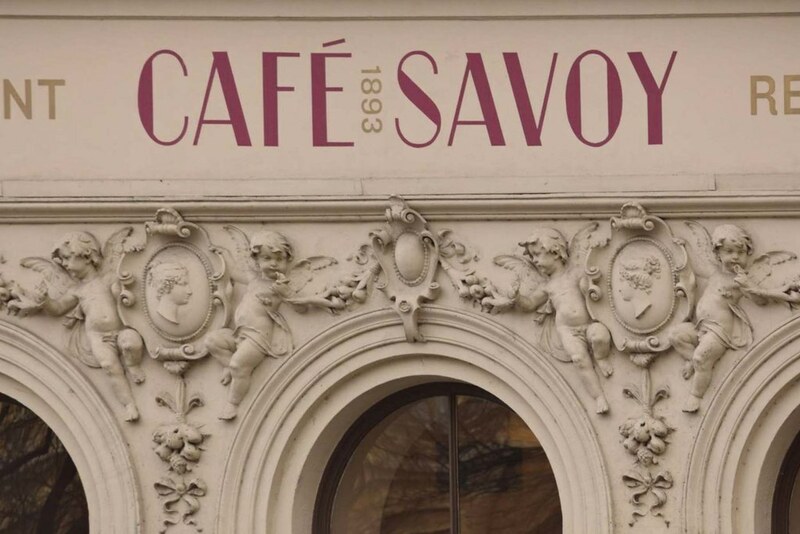 Cafe Savoy, větrník is a must have.